The big green ogre that is the heart of the "Shrek" franchise may very well be the Mickey Mouse of his generation. Whenever he steps on to the screen, before he even has the chance to utter a snide syllable, the audience is instantly drawn to him and his offbeat demeanor. Such distinctions don't happen very often in the art of movie artifice, but when they do, they are usually quite accidental. Consider Walt Disney's own timeless creation, for instance; Mickey Mouse didn't just become the studio trademark because that's the way it was supposed to happen, after all—rather, the talkative little cartoon rodent came into that honor because the viewers had never seen anything like him, and his artificial charisma left a lasting impression that was unmatched. Dreamworks, a known adversary to the Disney legacy, may have inadvertently challenged that distinction in the form of an overgrown (but lovable) swamp creature, who on occasion spouts one-liners, smiles halfheartedly and barks angry demands at those who get on his nerves. But what elevates him above the cliché of cartoon ogres and brutes is a persona that is as infectious and likable as cartoon personalities get, and the fact that the studio introduced this concept to viewers via a film that allowed him to be the primary hero only anchors that observation. The first "Shrek" film, of course, was marvelous not just because it challenged the standard of handsome princes getting the girls, but also because it poked and prodded the genre standard and became a great modern satire on fairy tales. The result was fun, refreshing, amusing and infectious at nearly every specific moment, and the great thing about its sequel, "Shrek 2," is that it doesn't lose the focus on any of those elements. Unfortunately, what it does lack over its now-classic predecessor is the element of novelty; now, when the CGI characters have something witty to say or take part in some kind of elaborate in-joke at the expense of something famous in pop culture, there is a pesky sense of deja-vu that undermines the punchline (at least partially). Still, "Shrek 2" ultimately accomplishes something that few (if any) cartoon movie sequels ever do: it builds on the existing narrative without feeling obligated to recall substantial components of the first film to get its big laughs. The movie opens rather amusingly, as the vein and self-centered romantic Prince Charming (voiced by Rupert Everett) ascends the steps of an isolated tower, intent on planting his lips on a fair princess and breaking the terrible curse that has kept her isolated from the world. Alas, the princess in question is Fiona (Cameron Diaz), who in the first film was rescued from the tower by none other than Shrek (Mike Myers), the ogre that everyone in fairy tale world seems to despise simply because of what he is. Fiona, cursed herself with a spell that turned her into an ogre much like Shrek, is now happily married to the brute and has embraced her alternate lifestyle. Unfortunately, no one bothered to tell Charming this little tidbit of information before he set off to claim his female prize. Soon after their honeymoon is over, both Shrek and Fiona return home to the swamp and discover that Fiona's parents, in the Kingdom of Far Far Away, have heard of her recent nuptials and are inviting both she and her new husband into the kingdom to get reacquainted. Much like Prince Charming, however, they too were never informed about their daughter keeping her new transformation as a permanent fixture, and when the unlikely couple, along with the lovable Donkey (Eddie Murphy), find themselves standing at the doorstep of the king and queen, the result is an almost catastrophic event. What this inevitably sets into motion is a plot that, much like the first, is rich in the way it isolates strong characters and then provides them a platform for a wide array of nifty side adventures. Aside from those already familiar to moviegoers, "Shrek 2" introduces us to Puss-in-Boots (Antonio Banderas), a sword-wielding swashbuckling feline who speaks in a heavy Spanish accent (obviously), and the Fairy Godmother (Jennifer Saunders), a twisted and cruel old woman who uses the standard fairy tale shell of her persona as merely a facade to hide all of her wicked ways. The conflict in all of this is that the Fairy Godmother is actually Prince Charming's own mother, and the news that her son's bride-to-be has settled down with a swamp creature is something that sends her conniving personality into hyper-drive. That puts increasing pressure on Fiona's father King Harold (John Cleese), who struck a deal with the Fairy Godmother years ago to ensure the spell on his daughter would be broken, but realizes now how hard it would be to simply undo her love for Shrek in order to fulfill that old deal. Narratively, this is the kind of sequel that so many others have probably only longed to be: thoughtful, extensive, focused and energetic without actually being a retread of the past. 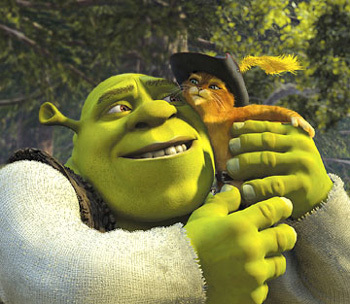 As such, the film also uses this factor as a springboard for all sorts of new ideas, not the least of which is a subplot in which Shrek and Donkey (with assistance from Puss-in-Boots) decide to help Fiona's relationship with her parents by acquiring a potion that would make them more attractive. The wit and satire, of course, are still in tact, too—consider a scene in which a Joan Rivers look-alike does a fashion review of the guests of a ball in honor of Fiona and Prince Charming, or a plot twist that allows several of Shrek's older friends to act as heroes in a "Mission: Impossible"-style rescue task. And yet despite all the detouring and all the plodding, the movie also doesn't forget that the emotional center is an overgrown giant green ogre. 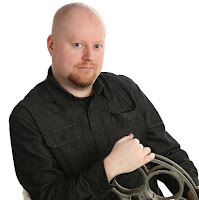 He is whom the viewer has come to see, and he is whom this inevitable franchise will continue to depend on for future installments. Watching him and his story evolve on screen is like witnessing the evolution of a rising star firsthand. We need not to dig very far to see what helps add to the relevance of this charming little CGI cartoon; the laughs are consistent, the smiles are there, and the resonance of the animation gives the movie a depth that boggles perspective. At the end of the day, yes, this is a film that doesn't dare tread the lines of masterful art that the first feature managed to; it is the inferior product of an untouchable masterpiece. But should that matter? Of course not. The fact that a solid, exciting and charming sequel exists at all in a series with such steep expectations as this should be the biggest virtue of all. As far as this critic is concerned, "Shrek 3" can't be released soon enough.